Most people have a favorite final episode and can think of more than a few “least favorite” finales as well. Well, to see if there was any clear consensus, a Reddit user decided to compile the data from IMDB to see which finales most people liked or found disappointing. 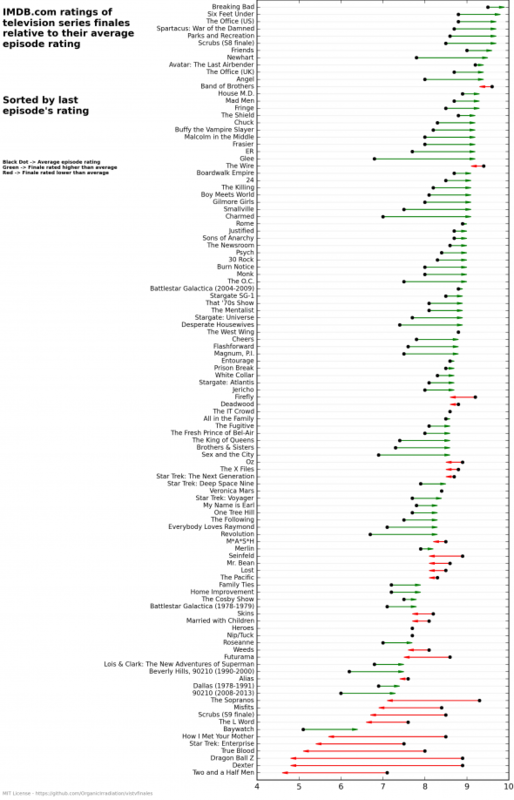 The first chart (you can click on the image to see it larger in a new window) looks at the average episode ratings from IMDB users (different from Nielsen ratings) relative to their ratings of a show’s last episode. This is a good indication of how viewers feel about the finale when compared to the rest of the series. In some cases, a finale was better than most episodes of the series (Glee, Charmed, Newhart) while others felt the last episode was a big disappointment (How I Met Your Mother, True Blood, Dexter). It’s interesting to see that some believe that popular series finales, like those from M*A*S*H and Star Trek: The Next Generation, weren’t as good as average episodes from the series’ runs. It’s also interesting to see that the finale of Roseanne is rated higher than average episodes. The second chart sorts the data based on the rating of the individual finales (where the arrows are pointing to). The black dots represent the average episode rating. 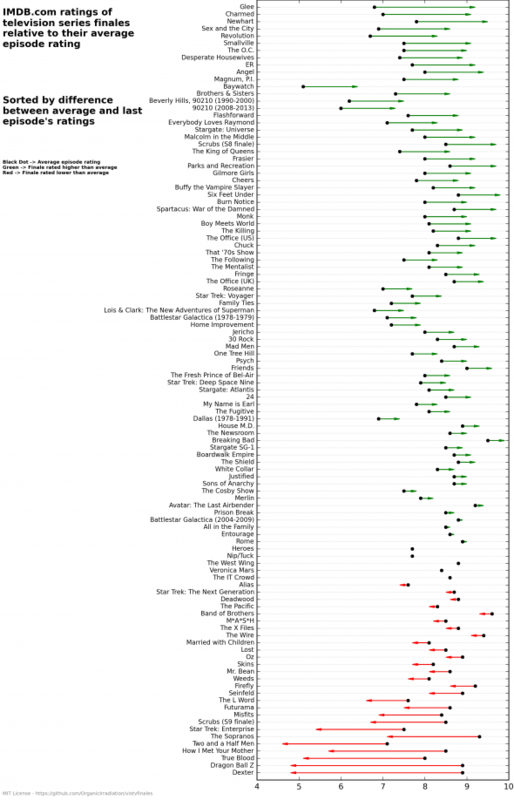 These viewers clearly loved the finales of Breaking Bad, Six Feet Under, and The Office while most believe Star Trek: Enterprise, Dragon Ball Z, and Two and a Half Men were underwhelming at best. What do you think? How do your favorites measure up? Do you agree or disagree with these ratings of final episodes? NYPD Blue. It was for the MOST part business as usual. I hate it when they try to put everything in a warm fuzzy blanket at the end with cameos and characters from the past. It always seems cheesy to me. I have two: Rectify and the last David Tennant Dr. Who (End of Time which was over 3 hours long) which did bring in a couple of the Doctor’s past companions, but well done. Good or Bad news Judy; Rectify is not over. There will at least be a 4th season. I’m not sure why season 3 only had 6 episodes, but there will be a season 4.